KEY WEST, Fla. — A teenager has died in a tragic boating accident in the Florida Keys. 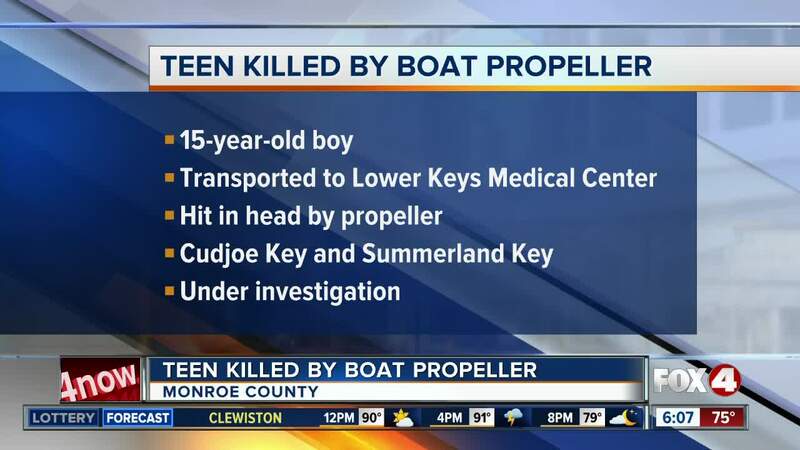 The Monroe County Sheriff's Office said the 15-year-old boy from Fort Myers, Florida was pronounced dead at Lower Keys Medical Center on Stock Island Sunday afternoon after he was struck by a boat propeller in Lower Keys waters. The Sheriff’s Office was notified of the incident about 12:30 p.m. and said the boy was struck in the head by a boat propeller. The Sheriff's Office said the incident happened in or near Kemp Channel on the bayside. The Sheriff's Office said the boy was taken to Venture Out Resort on Cudjoe Key to waiting paramedics. Investigators said a helicopter was called in and then canceled because the boy was going into cardiac arrest. The helicopter was put on stand-by and the boy was taken to the hospital on Stock Island, where he was pronounced dead.